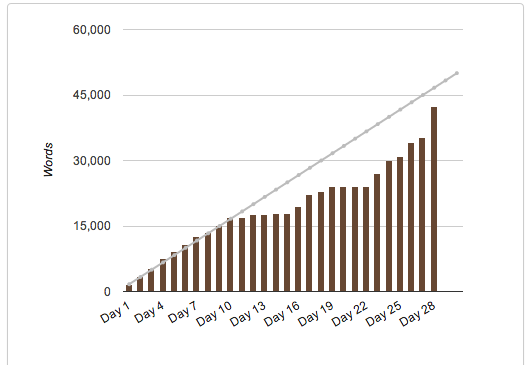 For those of you who read my last post following week 1 of the challenge, I actually did manage to keep up my word count for the entirety of that weekend (days 8, 9, and 10 on the graph). I was so very tired at the end of it, though, that I couldn’t get it together to do any writing on my workdays the following week. Oh, and I didn’t know where I was going with the story. I haven’t known where I was going with the story, except for a few tiny revelations that were enough to keep me trucking along and putting words on the page. I didn’t really find the answers to any of the big questions until about 7:30 pm today. So my NaNo project isn’t a narrative, per say. It’s about 40,000 words of me flailing away at the story, writing (sometimes in depth, sometimes not) about any aspect of it that I could write words about, and world-building and begging the world to tell me what it’s all about so I can keep writing and win this silly and arbitrary 50,000 words by November 30th challenge. The project won’t be done at 50,000; it will be just getting started. And actually, I’m pretty sure the flailing-away-at-your-story-in-any-way-you-can is pretty much the point of NaNoWriMo, so the event is doing its job. During those flat periods on the graph above I didn’t think I was going to finish, and I thought that was okay because the story just wasn’t ready yet. It wasn’t ripe. But I still wanted to win, you know? I still wanted to finish what I set out to do. And while marathoning some words today, trying to reach that arbitrary goal that will make me a NaNo “Winner,” I did find that piece of the plot and world-building I was searching for. Not that there aren’t a gazillion other problems I don’t even know about yet that are gonna crop up later on, but my point is that writing is the best thing to do for writing. And that’s the point of this entire exercise, right? Happy Thanksgiving, everyone, and a big congratulations to my writing buddies (http://amorecolorfullife.com/) who already won the 50,000 word challenge. You rock! Yes, yes, yes — absolutely! My story is not finished yet, but I got my 50,000 and I claimed my win. Some of my words are silly and impossible and it doesn’t matter because some of them are also good, and they point me in the right direction. I have learned a lot about myself and my writing through NaNoWriMo and I wouldn’t have learned any of it without that arbitrary and silly goal goading me on. You can do it!! We’ll see. We shall see.